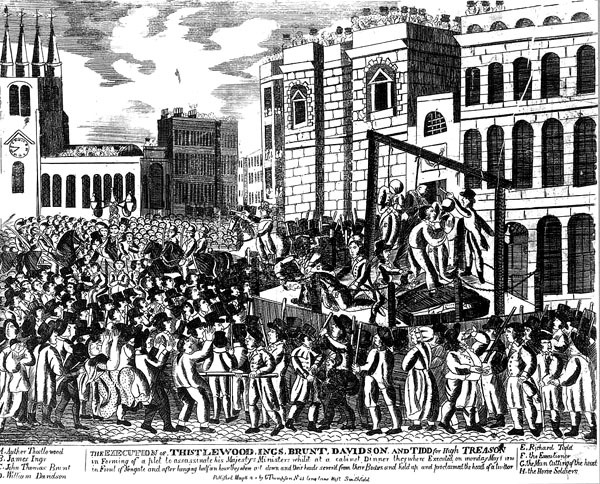 On this date in 1820 — which was not yet a red-letter day on the leftist calendar — five radicals were hanged at Newgate Prison for a plot to overthrow the government. A British government that had tilted from reactionary after the French Revolution to furiously repressive after defeating Napoleon was energetically at work stamping out the wide-ranging upheaval convulsing the isles. This excellent plot was hatched by none other than a government informant, who planted the idea among the circle and arranged their arrest when they took the bait. Already-notorious subversive Arthur Thistlewood was the jewel in the crown’s crown, particularly after having slain an arresting officer in the fray when the trap was sprung. Ten were condemned to death, five of those sentences commuted to transportation — leaving Thistlewood to hang* along with John Brunt, James Ings, Richard Tidd and the Afro-Caribbean tradesman William Davidson. The crowd was reportedly vocally supportive of the condemned. The Cato Street Conspirators hanged. 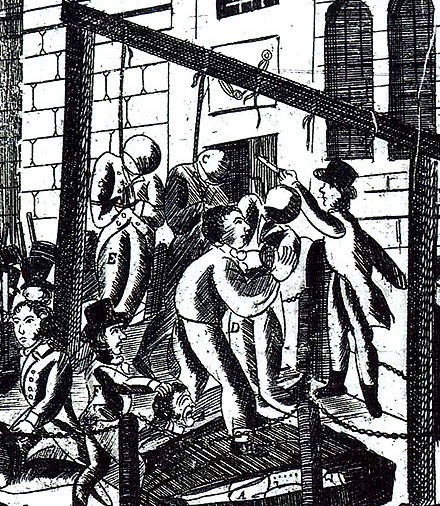 As represented at the bottom of the scaffold: the dead men were cut down after their execution and posthumously beheaded. The world at last to Freedom. Still, even from the safety of Italy, the rakish rebel had a gentleman’s disdain for these lowborn butchers overpowering anything at all. What a set of desperate fools these Utican conspirators seem to have been. As if in London, after the disarming acts, or indeed at any time, a secret could have been kept among thirty or forty. And if they had killed poor Harrowby — in whose house I have been five hundred times, at dinners and parties; his wife is one of ‘the Exquisites’ — and t’other fellows, what end would it have answered? ‘They understand these things better in France’, as Yorick says, but really, if these sort of awkward butchers are to get the upper hand, I for one will declare off. I have always been (before you were, as you well know) a well-wisher to, and voter for reform in parliament; but ‘such fellows as these, who will never go to the gallows with any credit’ … and make one doubt of the virtue of any principle or politics which can be embraced by similar ragamuffins. I know that revolutions are not to be made with rose water, but though some blood may, and must be shed on such occasions, there is no reason it should be clotted; in short, the Radicals seem to be no better than Jack Cade or Wat Tyler, and to be dealt with accordingly. They were. Archive.org has the free text of An authentic history of the Cato-Street conspiracy; with the trials at large of the conspirators, for high treason and murder; a description of their weapons and combustible machines, and every particular connected with the rise, progress, discovery, and termination of the horrid plot. With portraits of the conspirators, taken during their trials, by permission, and other engravings. Here’s a topical YouTube mashup combining the stylings of the band Cato Street Conspiracy with video of a different executed conspirator against the English government.